The Mexican government has awarded Boeing Co. a $1.03 billion contract for three communications satellites and an associated network of ground systems, the company announced Monday. 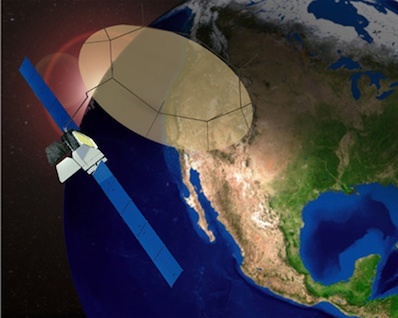 The MEXSAT satellite system will be used for federal government communications, including law enforcement and military activities that could encompass the ongoing drug war in Mexico, according to Juan Carlos leal Sosa, Mexico's director general for spectrum technology and social programs. "This will provide government and civilian broadband communications to Mexico, including high-rate mobile voice and data services to the federal forces," said Steve O'Neill, president of Boeing Satellites Systems International. "This will also significantly enhance Mexico's communications capability, expediting disaster relief, emergency services and satellite broadcasting for telemedicine, teleeducation and telegovernment." The MEXSAT system will ensure Mexican national security, aid response to natural disasters, help bridge the digital divide for the country's more isolated citizens, and safeguard the use of orbital locations and frequencies, officials said in a Mexico City press conference. Two high-power mobile communications satellites will be based on the Boeing 702HP platform. Boeing agreed with Orbital Sciences Corp. to build a fixed services satellite using the company's Star 2.4 bus. The Boeing satellites will be manufactured in El Segundo, Calif. Orbital will build its spacecraft in Dulles, Va. Launch services and insurance arrangements will be finalized in 2011, officials said. Owned and operated by the Mexican government, the MEXSAT fleet will replace the aging Solidaridad network, Sosa said. The Solidaridad satellites are managed by SATMEX, an ailing firm burdened by bankruptcy proceedings. "We are not trying to compete with SATMEX," Sosa said. "What we are trying to do is manage communications by ourselves and not have to rely on private enterprise." The Orbital-built MEXSAT 3 satellite, designed for fixed Ku-band and C-band services, will be the program's first craft to launch. MEXSAT 3 should be ready for launch by the third quarter of 2012 to cover Mexico and surrounding waters. Boeing's satellites, named MEXSAT 1 and MEXSAT 2, will launch in late 2013 and late 2014. The Boeing mobile communications craft will feature 72-foot L-band antennas to transmit signals to ground forces, helicopters and airplanes. The MEXSAT satellite architecture builds on Boeing's experience with Thuraya of the United Arab Emirates and the LightSquared cell phone network in the United States. MEXSAT round stations and user terminals will also be provided by Boeing in the turnkey agreement. "Our commitment is to deliver a turnkey end-to-end satellite communications system," O'Neill said in a conference call with reporters. Boeing's bid on the MEXSAT system beat out a proposal from Space Systems/Loral. European satellite manufacturers were limited by unfavorable euro currency exchange rates, according to Sosa. Monday's announcement marked the third major commercial multi-satellite deal inked by Boeing in the last 18 months. The company previously signed contracts with Intelsat and Inmarsat for a total of six communications satellites. Boeing's satellite manufacturing division is seeking more commercial work to supplement U.S. government contracts. O'Neill said his unit is aiming to reach a 70-to-30 ratio of government and commercial satellites. The MEXSAT contract is considered a commercial win. According to O'Neill, about 90 percent of the company's current workload involve government systems.